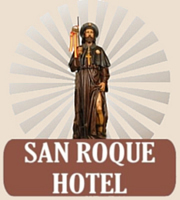 Hotel San Roque Cartagena offers accommodation in Cartagena de Indias. All rooms are fitted with a flat-screen TV. Each room comes with a private bathroom. Hotel San Roque Cartagena features free WiFi . The hotel also offers car hire. San Felipe de Barajas Castle is 600 metres from Hotel San Roque Cartagena, while Cartagena's Gold Museum is 700 metres away. The nearest airport is Rafael Núñez International Airport, 4 km from the property.